The combination of the Pantanal region along its main rivers and the drier regions far from the large rivers is a must to anyone seeking to know and get familiar with the Pantanal wildlife and biodiversity. The Cuiabá river and its tributaries by the end of the Transpantaneira Par Road, offers superb possibility to meet most of the aquatic bird life, besides giving us the BEST opportunity to meet JAGUARS roaming along there river banks and sand beaches as well as giant river otters. The natural grassland and forest along the Transpantaneira, offer us the best possibilities to meet other amazing wildlife as the giant anteater and the tapir, South Americas largest mammal. In these areas, birds are the most populous inhabitants of the region. Meeting and greeting at Cuiaba airport. After a briefing on your trip and itinerary, departure at 13h20 to Porto Jofre region. This transfer is divided into two different stages. The first is a journey on a paved road along farms and cattle ranches. After reaching Poconé – a small mining town and the gateway to the Northern Pantanal, we take the Transpantaneira Park Road at km “0” (108 km / 67.1 mi. from Cuiaba). This is a park road at its best, allowing us to drive above the water level, watching the flora and fauna of the Pantanal ecosystem – a photo safari along 146 km of dirt road with several stops along the way for photos and information. Arrival at your choosen Hotel in Jofre Region for dinner and accommodation. 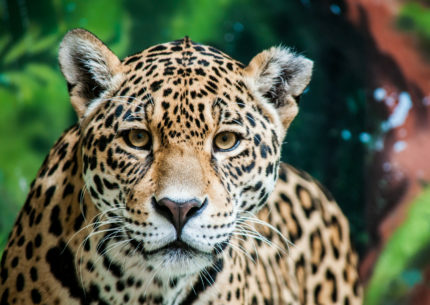 The area between the Cuiabá, Piquiri and Three Brothers rivers hold the Meeting of the Waters State Park, home for a superb high concentration of jaguars (over 60 individuals). After early breakfast, depart for a morning river safari on motor boat along bays and channels of Cuiabá River and tributaries. 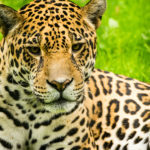 This area is home of great wildlife, such as Caymans, capybaras, giant river otters without mention the hundreds of birds and of course the jaguars. Returning to the hotel for lunch and rest, and restarting later in the afternoon searching until sunset. Dinner and overnight. Breakfast yet at the hotel. 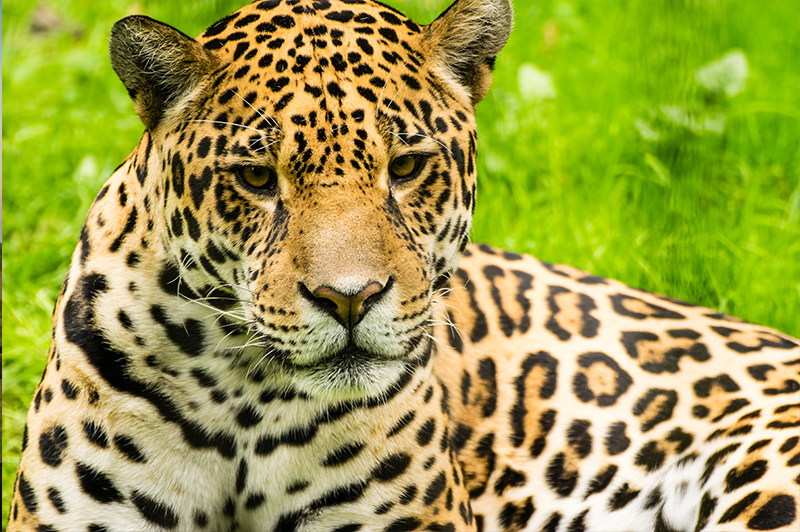 Possibility of joining an optional morning river safari to increase your chances of spotting jaguars. Departure along the Transpantaneira Park Road to Araras Eco Lodge, on a photograph safari. Accommodation and lunch. Later, you will be guided on an introductory walk through the surroundings of the lodge, as far as the Great Egret Lookout, a 12 m / 39 ft. high observation tower. After dinner, night walk under the Southern Hemisphere sky. After breakfast, take a photo safari through private dirt roads towards the Clarinho River. Reaching its banks, board a canoe and paddle down the river, exploring the forest that grows by the riverbanks and mangroves. Here lives a colony of “ariranhas” – giant river otters. With some luck, you may spot a family playing with their babies and teaching them how to swim and fish. Chance of fishing the elusive piranha, not an easy task, but fun. Enjoy a barbecue lunch under the shadow of the threes (*). Hammocks are slanged to enjoy a “siesta”. Return to the Lodge in time for the afternoon tea. Later on, trek the Howler Monkey trail to the Howler Monkey Tower, our highest observation point – 25 m high -, for a magnificent view of the sunset. After dinner, join a night drive in search of nocturnal animals. (*) If the Sentinela Camp is not accessible (depending on the weather and terrain conditions), this canoeing tour will take place on the Corixo River. In that case, we will return to the lodge for lunch. After breakfast, enjoy a horseback ride, which will allow you to explore the diversity of the Pantanal landscape including some flooded areas of the Pantanal plain. The Pantaneiro horse are docile and has adapted, through the centuries, to eat with its nose underwater. In this region, the horse is the Pantaneiros’ best friend, a daily companion during work and leisure. Return to the lodge for lunch. In the afternoon, trek the Rondon Trail towards the 13 m high Jabiru Stork Tower, where you can watch a Jabiru Stork nest. Return to Araras Eco Lodge for dinner and overnight. Which is the nearest airport to Araras Ecolodge? 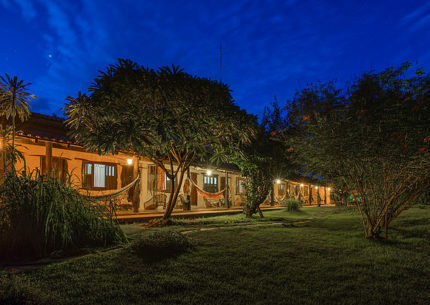 You should reach the Northern Pantanal, where Araras Ecolodge is located, through Cuiaba Airport, which is just 132 km from the lodge: 100 km on paved road toward Pocone – a small mining town and gateway to the Pantanal + 32 km through the Transpantaneira Park Road, dirt and scenic. Is the transportation from Cuiaba included? Our packages for Araras Ecolodge only have got the two options: with or without transfers. If you have been confirm the full package, regular transfers in air conditioned vehicle are included from/to Cuiaba Airport. The journey takes about 2h30. To ensure that our guests do not lose their return flight from Cuiaba, we count on minimum 4 hours for the return transfer: 3 hours for the journey and 1 for the check-in. Why do I need to inform you about my arrival schedule? May I just tell you which transfer schedule I prefer? If you let us know about your arrival flight details, we will meet you at the airport, right after the baggage claim area, avoiding misunderstandings. Also, if your flight gets delayed, we will know in advance and will do our best to assure that you don´t lose a transfer to the lodge. One of my flights doesn´t fit your transfer schedule. How can we handle it? It is possible to book private transfers at any schedule – supplement applies. Please contact our reservations department. I´ve booked the package without transfers. May I book them later? Yes, of course. However, the confirmation of this service will depend on the availability at the time of booking. We suggest a minimum of 3 days in advance. I´ll arrive at Cuiaba a few days in advance and will be staying at a hotel. Do I have to meet you at the airport for the transfer? No. We can pick you up from your hotel in Cuiaba. Please be sure to inform our reservations department. I will arrive at Araras Ecolodge during the morning. May I check-in? Is lunch included? You will be most welcome if you arrive in the morning. However, your room may not be available before 2 pm. Lunch on the day of arrival is not included, but if you let us know in advance, we will provide lunch and you can settle locally this extra service. 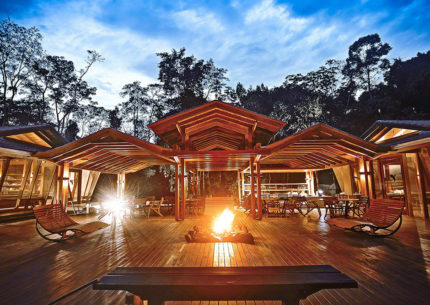 I´ll depart from the lodge at 12h30. Is there any activity programed for the last morning? If you leave the lodge at 12:30 or after, your guide will organize one last activity before lunch. 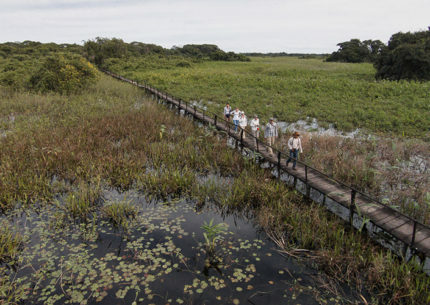 During the regular activities, each of our guides – who are experts in nature and have an in depth knowledge of the flora and fauna of the Pantanal Flood Plain – is assigned to small groups of 8 to 10 guests, for safety reasons but also so our guests may deeply enjoy their experience with increased chances of spotting wildlife. May I book a private guide? Our packages include regular activities, but it is possible to book a private guide for your group or family, according to availability. A supplement applies: please contact our reservations. Are the activities accessible for everyone? The difficulty level of our activities is light to moderate, and considered accessible by most of our guests. However, some people with walking difficulties may have some issues with some of the activities. If that is your case, please contact our reservations department, for detailed information. A private guide may be a solution. Our activities follow all the rules for Safety Management and are monitored through radio. However, precisely for safety reasons, the horseback riding is not allowed for children under 6 years old. Will I be able to use my mobile phone and access the internet? Generally, there is no mobile coverage at the lodge. You will be able to access the internet through complimentary wifi in social areas. I´m a vegetarian or I’ve got some food intolerance? Do I have to let the lodge know? Our meals are buffet, with various dishes, including vegetarian. However, if you let us know, we will be able to serve you better. What should I take to the Pantanal? We recommend light cotton clothes for the activities, including trousers and long sleeved shirts (against the sun and insects) and walking shoes or boots (very important). You should also avoid dark colours. Please do not forget your shorts, t-shirts, swimwear, hat with a brim, knee-high socks (the ones for sports) and 2 extra pairs of shoes. From June to September, at night, temperatures can be as low as 4°C- 39°F: a sweater or windbreaker may come in handy. You may also find useful to bring your camera, sunglasses, binoculars, pocket flashlight, pocket knife, mosquito repellent, sunscreen lotion, your prescribed medication (including anti-histaminic), batteries and toiletries.